While Cydia is the best third-party App Store for the iOS device, it requires the users to jailbreak their devices because Cydia does not work on non-jailbroken devices. Zestia is said to be the best Cydia alternative. 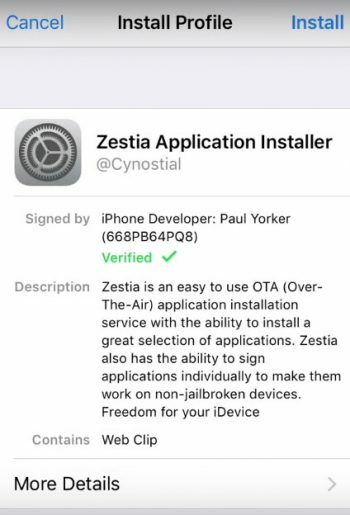 If you want to download Zestia on iOS without jailbreak, here is how to do it. As I said, Cydia is a great third-party App Store for iOS devices and has tons of apps and games. But, a lot of iOS users don’t want to jailbreak their device just for installing third-party apps as it jailbreaking the iPhone and iPad involves risk of bricking the device and worse is voiding the warranty. Zestia, on the other hand, can offer most of the Cydia features on a non-jailbroken iOS device. It is not exactly a Cydia Alternatives but does offer a good number of apps and games modes for free. Zestia can also help you decide whether to buy a premium app from the App Store or not. If an app on the App Store does not offer a free trial, you can use the Zestia to download the paid app for free, try the app and then decide whether to buy the app or not. Zestia has the up-to-date collection of apps and tweaks for all the application in the App store. Zestia allows you to download paid and games for free. Download tweaked apps and games without jailbreak. Download cracked apps, mods, and cheats without jailbreak. Zestia works on iOS 9 and above version including iOS 10 and 11. Zestia is the best Cydia Alternative and was known as X-Cydia before being named as Zestia. Open Safari browser on your iOS devices. It is important that you use safari web browser here because the links won’t work on other browsers or devices. In the Safari browser type this address https://xcydia.lmdinteractive.com/ and hit go. Wait for the web page to load and you will see Install Zestia button. Tap on Install Zestia button. It will ask you to install the profile and ask you enter the pass code “Install the Profile“. The installation may take a few minutes as the app will be downloaded and installed on your iOS device. The Zestia App icon will appear on the home screen when the installation is complete. 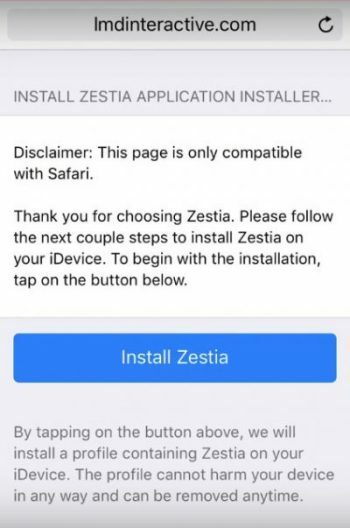 Before using the Zestia App, you need to trust the Zestia Profile in the iOS device settings. To do this go to Settings > General > Profile & Device Management and tap on Zestia profile. Tap on Trust Zestia twice to make the app trusted. Close the Settings page and go to the home screen. Tap on the Zestia icon to open the app. The app lists all the popular mods and tweaks on the home page. You can also use the search feature to find the apps that you want to download. One advantage of using Zestia over the Stock iOS App Store is that Zestia offers exclusive apps that are not available on the App Store officially. Zestia also does not expose your device to any risk as it does not require a jailbroken device to work thus keeping your warranty valid.